I know I’ve been MIA for almost two months now; I’ve been enjoying and settling into local life in Taipei, travelling a bit within the country, meeting new local friends, participating in community events, volunteering etc. Of course learning Mandarin at the university is taking up a lot of my time; the course load is heavy, despite the part-time hours, and the pressure from my professor to perform at my best is intense. Within 4 months I progressed from Level 1 to Level 3. It’s definitely quick acceleration of learning. I hope to write about my Mandarin learning experience at some point this year when I complete it! Since Christmas is not really celebrated in Taiwan (don’t be fooled by all the Christmas decorations displayed all over town especially inside or outside of department stores in Taipei; it’s all commercialized) I decided to fly over to Hong Kong for a few days to be with family when I found out that they would be there! 🙂 I’ve always heard that the Christmas lights are the best in Hong Kong and it’s a must-see (yes, it’s also commercialized like Taipei but hey, I’m with family during Christmas there! ), so I’m thrilled that I finally got to see it in person and check that off my bucket list. The epic Christmas lights and decorations in Hong Kong did not disappoint at all. To welcome 2016, I checked off another bucket list item, which was to see the spectacular fireworks explode from Taipei 101 at the stroke of midnight. There are so many places throughout the city that you can see it (near Taipei 101 where a special free countdown concert is being held, hiking up a mountain to see it or just standing in a corner of a street with a good view etc. ); it all depends on your preference: to see it far or near. Instead of waiting for hours outdoors like I did in NYC last year, this year I decided to join my new friends to see the fireworks from their apartment rooftop. It was definitely less crowded. The perspective was different but still very beautiful as I could see the whole city. Tip: My friends and I discovered that the MRT Station Daan, exit 4 (street in front) has a very good view of Taipei 101. My cell phone camera does not take night time photos well especially if it’s far, so this photo of Taipei 101 fireworks close up is not mine. It’s shared graciously from a friend of a friend who saw it closer than I did. After the fireworks ended, my friends and I decided to walk towards Taipei 101 (Xinyi area) to experience the crowd. To our delight, the party was still going on strong. Of course the bars, lounges and cafes were full to its capacity so they did not accept any newcomers. In fact, to our surprise, some places were closing down “early.” However, a lively night market was set up and it was fun to walk around to feel the crowd atmosphere and to buy some Taiwanese snacks (小吃) to eat. We stayed around the area till around 3:30am because we were extremely exhausted from a long day of school and then countdown. When we left, I can honestly tell you that the locals were still wide awake and socializing in every corner of the streets in this area, from sitting on available benches to just sitting on the ground. Many older locals tell me that the western New Year (January 1st) is only celebrated by the young people, which is evident from what I saw on the streets on January 1st. However, according to them, Lunar New Year is an integral part to Taiwanese culture so everyone celebrates it from young to old. I learned a cool tradition and activity that you can do if you’re in Taipei before the Lunar New Year starts. Many locals go to the temples to receive free Spring Scrolls which they use to decorate their home for Lunar New Year. They are called “Spring” scrolls because Spring is the season that represents growth and a new beginning. Hence Lunar New Year welcomes the beginning of Spring. One of my classmates told me about Xingtian Temple and that the Spring Scrolls were beautiful. As a result I went there with my language exchange friend to check out the temple and receive the scrolls. According to both of them, many people line up to receive the scrolls, especially on weekends. True to their words, it seems as if the people entering the temple was never-ending. Although the line may seem long, it moves very fast; I think we only lined up for about half an hour before we got our scrolls. To avoid the crowd, you can go during a weekday. They give out Spring Scrolls daily from 8:30-19:30 during this period before Lunar New Year. It is very easy to get to Xingtian Temple. 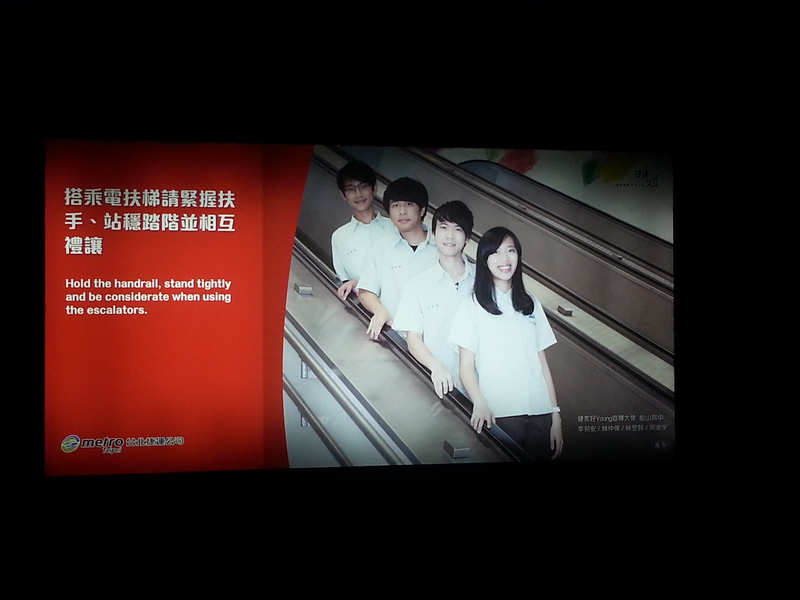 It has its own MRT station on the yellow line. It only takes about 10 minutes to walk to the temple from exit 3. Temple volunteers ask each person which Spring Scroll they want, and you collect the ones you want from table to table, until you reach the end. I took some Spring scrolls that hold meaning for me; for example the one word on the red square piece of paper means “Spring” and the two words below it mean “peace”. In the end a patient temple volunteer rolled all the scrolls for me and put them into a plastic bag for me to take home. According to my landlord, it is a nice gesture to leave a small donation before leaving the temple, as a token of appreciation, since the temple took time and effort to produce so many beautiful scrolls to give to everyone for free. Thank you for reading my long New Year post! I have now been in Taipei for two months, and I feel like I’m finally settling into this beautiful and dynamic city, after going through some minor culture shock, as any person would as they move into a new country. Many of you have asked me what life is like here and are interested in hearing about the everyday life of the locals and how I’m adjusting. I’m happy to share with you all as seen through my own personal lens. Lesson #1: The umbrella is my best friend. I am not kidding when I say this. 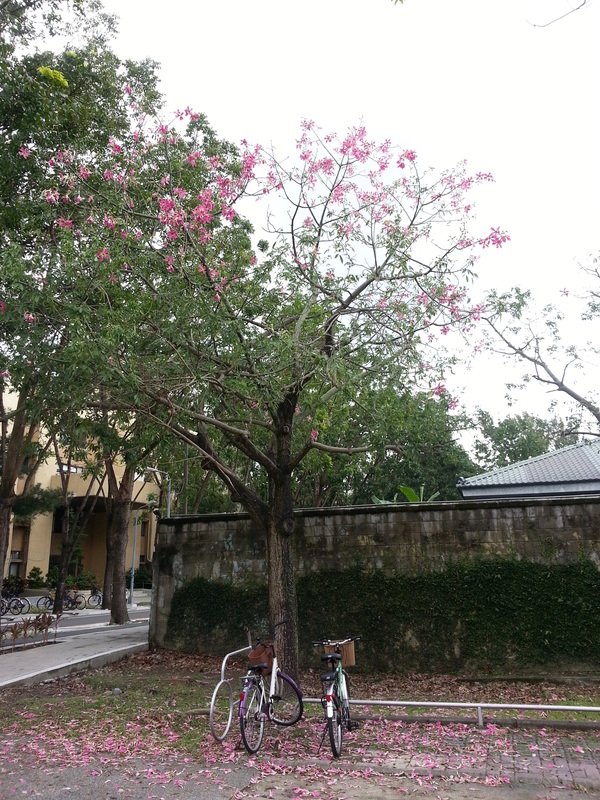 The weather is unpredictable at times, and I’ve found out that it rains a lot especially during summer and autumn. After all, it is typhoon season. Thus it’s super handy to have an umbrella on me at all times because it might rain after a few hours of sun, or vice-versa. I used to scoff at the idea of people especially ladies carrying umbrellas while it is sunny. The main purpose of carrying the umbrella is to protect their face from the sun. Guess who is doing that now? Me. The sun is extremely strong here and even with sunblock, it doesn’t protect my face from the sun properly. I get freckles easily from the sun so in the interest of having as little freckles as possible on my face, I have now resorted to using the umbrella like the locals. Frankly, I feel quite at home doing it. I guess this saying is true: “When in Rome, do as the Romans do.” 😉 Well, in this case, do as the Taiwanese do! Locals use the umbrella for rain or shine too. Lesson #2: Mosquitoes are my enemies! Since day one of my arrival, I’ve been pestered by these little bugs. In my naivete, I thought there would be hardly any mosquitoes in Taipei since it’s a big city. Well, how wrong I was. It seems that they are everywhere and they love me a lot. Almost every day when I come home, I have a new mosquito bite mostly on my legs but sometimes in very interesting places that I’ve never had while in Canada. 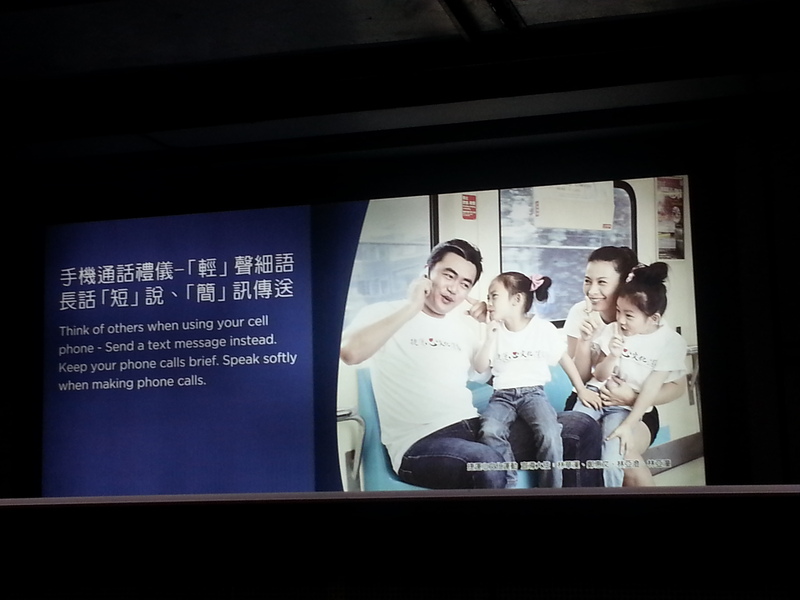 Lesson #3: Taiwanese people are really friendly and helpful. 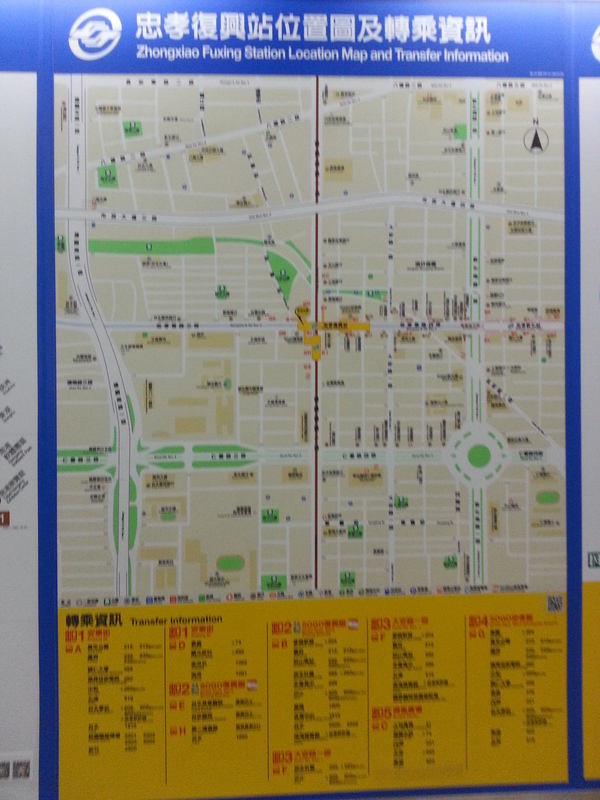 I know I’m quite directionally challenged, but before leaving Canada I was determined that while living in Taipei, I’ll work on my own navigational skills and REALLY learn how to read a map. I mean, come on, everyone knows how to read a google map right? Well, apparently not. On my first day of using google map on my cell, I was extremely unsuccessful. Instead of arriving at said place which was about 5 minutes from my location, as indicated by google map, I was getting further and further away. 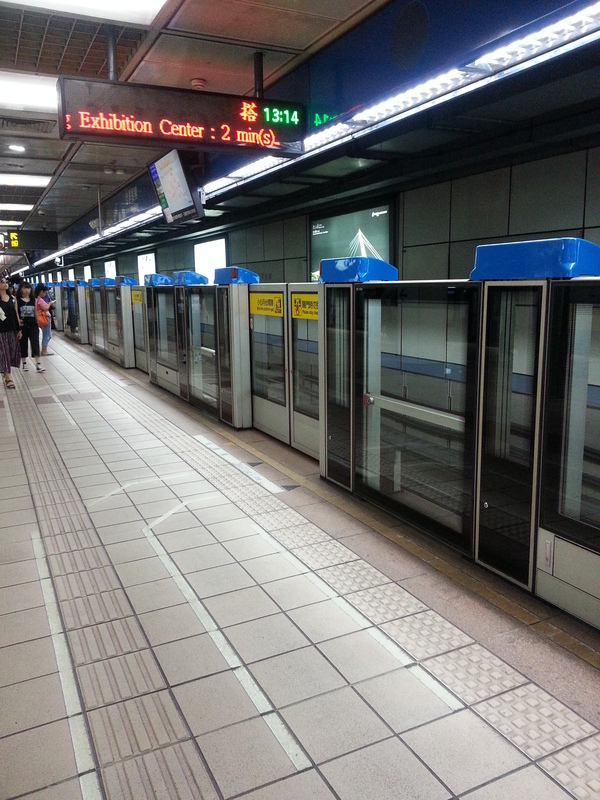 Lesson #4: Taipei’s subway (MRT-Mass Rapid Transit) system is amazing! My home is right next to a subway station and I have to tell you that I’m simply amazed by how the MRT runs. Like clockwork, I can rely on it consistently. There are screens located throughout the station telling passengers when the next train will arrive. It’s really high-tech, in comparison to the subway system in my home city. 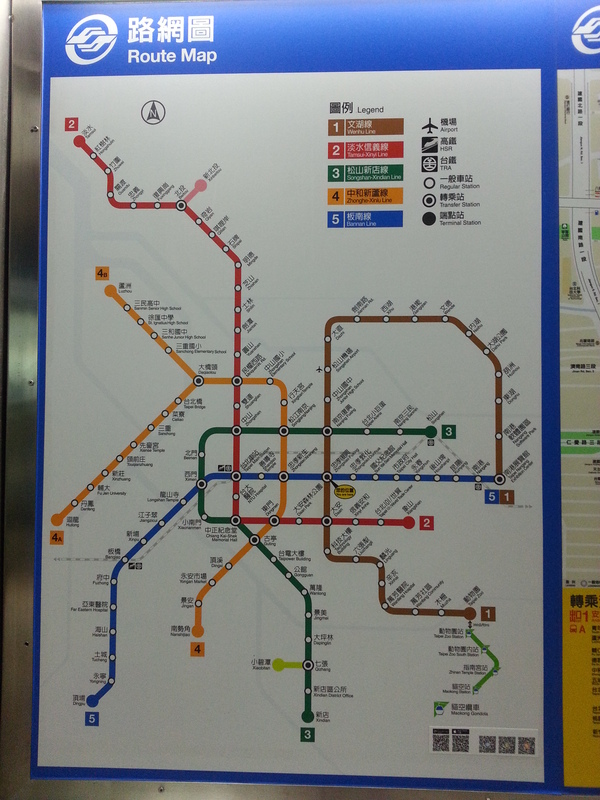 And you can go almost everywhere in Taipei using the subway system as many main attractions have their own station name, and each station has at least 4 exits where the places and streets you want to go to are clearly labelled, so you know which exit to take to reach your destination. Love the screen indicating when the next train/subway will arrive and the clear white outline on the floor allowing commuters to line up in an orderly way! I’m also amazed by the good manners of the commuters. 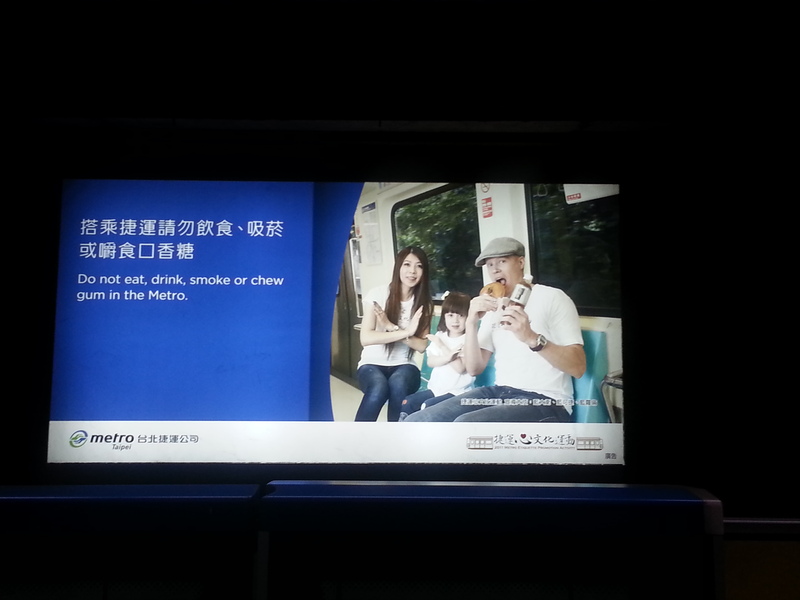 Since I’ve been here, I’ve only seen everyone abiding by the rules of the MRT. For example, the priority seating on the subway are colour coded in blue; and no one occupies it unless they are elderly, pregnant, handicapped or with very young children. When you get off the subway, no one is rushing off; there’s almost a zen like atmosphere, where people follow one after the other to go on the right side of the escalator and wait patiently for their turn to board it to go up. Even people walking on the left side, are walking calmly, as if they have all the time in the world. I take this extremely long escalator to go to university every day. It’s always calm and quiet. Each subway station is generally very large like this and really well organized and clean!! 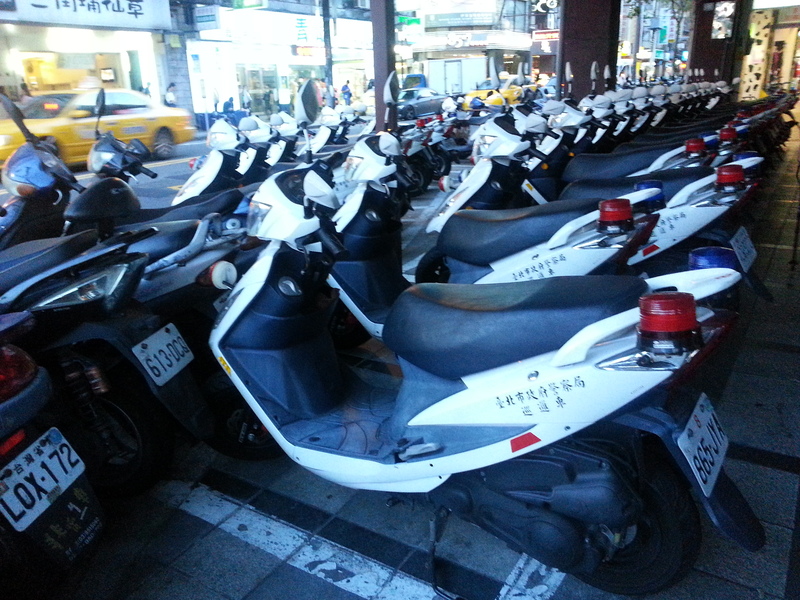 Lesson #5: Taipei is extremely bike-friendly! In almost every big intersection I walk to, there are bikes that I can use to go anywhere when I don’t feel like walking. I simply have to use my EasyCard to rent a bike and off I go. 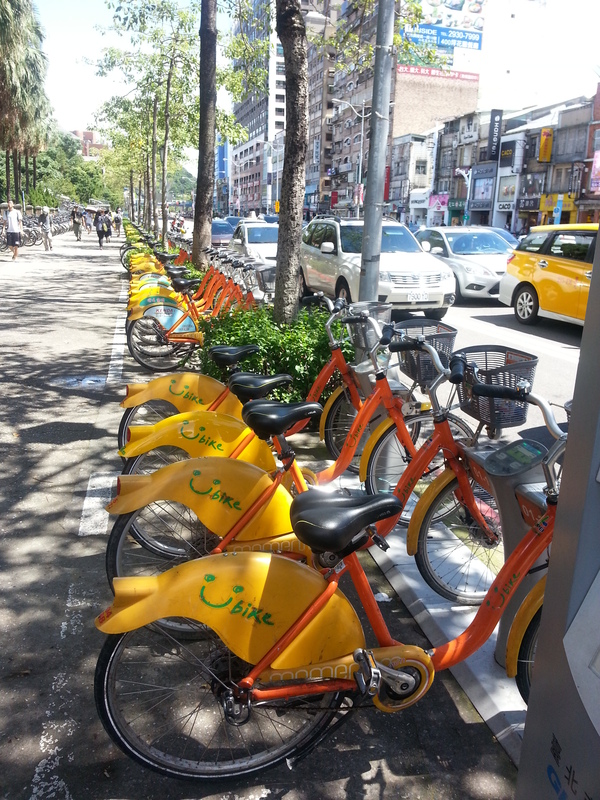 These bikes, known as YouBikes, are owned by the Taipei city government and it’s for public use. The government wants to encourage its citizens to use these bikes as a greener alternative to improve the quality and environments of its city. The EasyCard works on the MRT, Bus, YouBike and even some convenience stores and coffee shops!! I love using it, it’s really convenient. It seems like there are more motorcycles and scooters on the road than cars. Usually I see only motorcycles/scooters at the front behind the traffic lights; cars are behind. Most police officers ride a motorcycle on while on duty! Now I’m so used to seeing many motorcycles and scooters on the road; it’s just a form of transportation and way of life here. 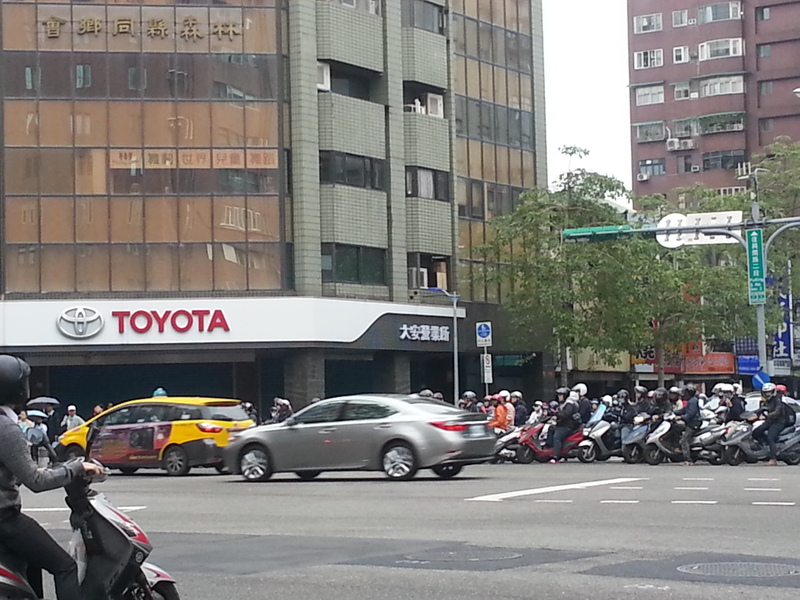 Some might think that Taipei might be a bit too bike-friendly as bikes and motorbikes/scooters are allowed on the sidewalk with pedestrians. At first I was scared of being run over by the bikes and/or motorcycles/scooters as I’m walking on the sidewalk but after a few weeks, I got used to it. Plus, the cyclists or motorcyclists are quite experienced in navigating on the sidewalk.